Having a global impact on poverty starts with the courage of families struggling to overcome poverty and the compassion of donors who believe every person should have the opportunity to be free from poverty and live with dignity. The support of donors, along with an integrated approach driven by the ingenuity of our long-term partners in the Americas, South Asia, South East Asia, and Africa, enables families to develop and implement local solutions to poverty that are effective, replicable, and sustainable. This ensures that the life-transforming outcomes of every dollar given to HOPE International Development Agency are multiplied as families access clean water, grow more food, increase their income, restore their environment and health, and learn new skills that ensure their well-being. The Tejeda family is a wonderful example of the transformation that happens when clean water becomes available in a community. Prior to the completion of a community water and irrigation project, the Tejeda family struggled to make ends meet; there was never enough food on the table and no prospects for a better life. 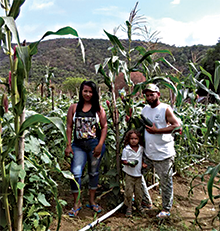 After participating in an irrigation project in their community of Cazuela, a remote village located in the mountains of the Dominican Republic’s San José de Ocoa province, the Tejeda family irrigated their farm land for the first time and are now planting and harvesting 3 crops per year. Today there is ample food on the table each day, and the income earned by selling a portion of each harvest of cucumbers and other vegetables has enabled the family to purchase necessities, including medicine when needed. In addition, their children are now in school and the family is improving their modest home. In the final post of a three-part series on community pharmacies in Honduras we meet Lucinola Bustamante, a volunteer community pharmacist helping families in her rural community of Los Naranjos. Lucinola plays a vital role in providing basic health care to families in remote areas of Honduras like Los Naranjos. She meets community members in their homes or at her home-based pharmacy, building a relationship with each family she serves. This relationship is crucial to improving health outcomes among families struggling with poverty and serves to strengthen bonds within the community while providing a sense of security and well-being. 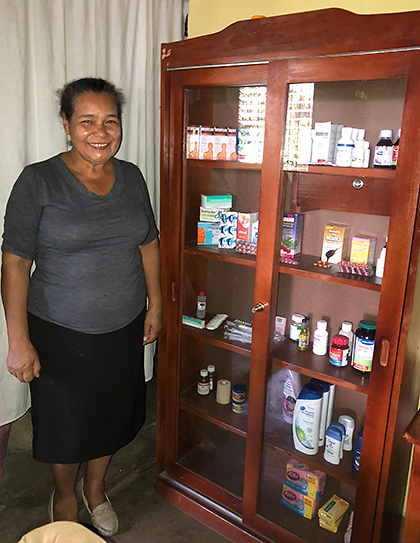 Lucinola begins her week by visiting the local supply warehouse and picking up medicines and other health care products to stock the community pharmacy located in her modest home. After returning home, Lucinola begins visiting her patients for the week. Depending on the time of year, Lucinola will treat three to four patients per day. In the rainy season, when weather-related illnesses are more prevalent, the number of visits increases. Each consultation is free to the patient, and any subsequent treatment is provided for a nominal service fee. The nominal fee is important to families within the community because it gives them a sense of dignity and control of their lives and health. The majority of Lucinola’s patients are mothers and children. The most common health concerns are colds and flus, head and body aches, diarrhea, minor infections, and respiratory problems. Lucinola is trained to take blood pressure readings, temperatures, check ears, eyes, and throats, and enable patients to use a nebulizer which helps all types of respiratory problems. Drawing on the training and health manuals provided to her by local staff, Lucinola administers basic over-the-counter medicines including pain killers like acetaminophen, allergy medicines such as diphenhydramine, vitamins, including Omega-3 which helps prevent and manage heart disease, and prenatal vitamins for women who are pregnant. While Lucinola cannot prescribe advanced medications, she is still able to treat more than seventy percent of the ailments families in Los Naranjos experience. Complicated health concerns are rare, but if they do occur Lucinola refers patients to clinics that have advanced health practitioners. “I am so happy to be a volunteer pharmacist and help my community,” says Lucinola, who has seen a substantial improvement in the health of families in Los Naranjos since the introduction of the community pharmacy she so proudly manages. Lucinola takes great pride in her volunteer work and recognizes the immense value her little pharmacy brings to the community of Los Naranjos. To ensure Lucinola serves her community well, she makes her pharmacy available to patients all week, day or night. By providing medicines and medical supplies that support a variety of health facilities in Honduras, including more than 500 community-based pharmacies in remote areas of the country, HOPE International Development Agency is helping address a chronic lack of health care in the country. Join us for dinner in April and May and help transform lives in the Philippines. View dates and locations today and make sure you reserve your seats soon. Join us for a wonderful meal, the company of friends, silent and live auctions, great music, a short feature film, and an important opportunity to transform lives in the Philippines through your giving. View a brief update about how giving at last year's film premiere and dinner transformed lives. Establishing a community-based pharmacy in a remote area provides a unique opportunity for people to work together to create a sustainable solution to one of the most persistent challenges they face – a lack of basic health care. Before a community-based pharmacy is established in a community, HOPE’s local partner visits the community and speaks with residents regarding their health care needs. If health care services in the area where the community is located are lacking – a far too common occurrence – the community is asked to collectively decide if the establishment of a pharmacy in the area would be beneficial. The process of deciding is important because it enables community members to voice their health needs and help establish which medicines will best meet the needs of the community. Equally importantly, it gives community members ownership of the pharmacy and the health outcomes associated with the pharmacy. As part of the process, one community member volunteers to run the pharmacy out of his or her home. Once a volunteer is agreed upon, staff from HOPE’s local partner provide the volunteer with training, equipment, manuals, and ongoing support through medical professionals. The volunteer pharmacist stocks the community-based pharmacy with medicines and medical supplies provided by HOPE, offers free consultations and diagnoses, and provides basic treatments for a nominal fee. The nominal fee is important to families within the community because it gives them a sense of dignity and control of their lives and health. Community-based pharmacies bring many positive changes to the communities where they are established. People are no longer forced to journey many hours to reach the nearest health clinic, nearly eliminating the cost of transportation and time spent traveling. They are also able to receive immediate help, reducing the potential for health complications which can have negative consequences. Medications, when needed, are provided at a minimal cost, enabling people to save their hard-earned income for other necessities. Being healthy, as a result of having a volunteer-run pharmacy in their community enables people to pursue opportunities to increase their income generating activities, bringing them closer to self-reliance. What a tragedy it will be if families who survived politically motivated violence that forced them from their home villages don’t survive – especially after all they’ve been through and sacrificed. Frehiwot, our Ethiopian colleague working among the poorest of the poor in Ethiopia, made a promise to do what she can to save lives in Amhara. The situation is so dire that the Ethiopian government, who are doing what they can, has also asked for our help. More than 90,000 people are at great risk because of severe food shortages that has the Amhara region of Ethiopia in its deadly grip right now. A gift of $40 would help ensure that one family receives the emergency food supplies they so desperately need. The families who fled their home villages and are now living in the Amhara region of Ethiopia have endured so much. They’ve been forced from their homes, pursued by armed groups, and left with nothing but the clothes on their back and the meagre possessions they could carry. Some have lost loved ones along the way. Your help today would be an act of kindness that will give these families renewed strength to overcome the fear and hunger that has become their constant unwelcome companion. 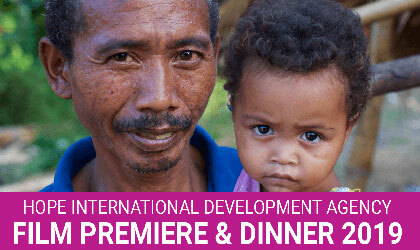 The first of our spring film premiere dinners is less than two weeks away, in Winnipeg, on April 12. View dates and locations today and make sure you reserve your seats soon. Join us for a wonderful meal, the company of friends, silent and live auctions, great music, a short feature film, and an important opportunity to transform lives through your giving. Facts without action quickly become mere sentiment. 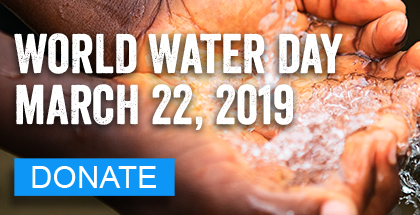 As people in the developed world learn or engage with World Water Day, March 22, 1 in 10 people in the world are living without access to clean water. Most live in rural areas and spend extraordinary amounts of time collecting water from wherever they can. The United Nations estimates that people in Sub-Saharan Africa alone lose 40 billion hours yearly collecting water: time that could be better spent creating income, going to school, and improving food production, just to name a few transformative outcomes that would be possible if people did not have to spend so much time collecting water. Even worse, nearly all of the water they collect carries bacteria and parasites as evidenced by the grim statistic that close to 1 out of every 5 deaths under the age of 5 worldwide is due to water-related disease. Those are a few of the facts. Now for the hard part. Will we take action today? We should, knowing the devastation being caused by unsafe water every minute of every day is completely preventable. So on World Water Day, do not let facts become mere sentiment. Take action. Today you can give to help construct a borehole well to provide clean water that ensures potentially deadly health crises, like diarrhea, dehydration, and waterborne diseases, are no longer a threat to displaced families in South Sudan who have survived so much heartache and been so deeply traumatized. Have dinner with us in April or May and watch families in the Philippines journey from despair to hope. Families are out of options when they arrive in the Ibba region of conflict-ridden South Sudan. The only thing they haven’t lost is their lives. Political disagreement in South Sudan, Africa’s youngest nation, descended into civil war in which nearly 400,000 people lost their lives. Opportunities for a better life vanished as armed conflict between rival political factions spread and intensified, engulfing countless communities along the way. Today an estimated 4.2 million people no longer live in their original homes or communities. About 2 million of those are displaced within South Sudan and the remaining 2.2 million are outside the country. But hope is not lost. It can be found, right now, amidst the thousands of people living in Ibba, especially with the emergence of a peace agreement in late 2018. The work being done, through support from friends of HOPE International Development Agency, is ensuring that the most vulnerable receive the care they need. HOPE donors made sure emergency supplies were available. They also ensured that families uprooted from their homes and regular routine of life could begin rebuilding their lives through access to clean water, education for children, health education, and hygiene training, in Ibba. Right now, there is a critical shortage of access to clean water in Ibba, an area under pressure because so many people have fled their homes for the safety of Ibba. A gift from you of $50 will provide clean water to one person in Ibba. Having access to clean water is critically important, especially for those who are most vulnerable: children and mothers. A gift today will help construct a borehole well to provide clean water that ensures potentially deadly health crises, like diarrhea, dehydration, and waterborne diseases, are no longer a threat to families who have survived so much heartache and been so deeply traumatized. Community pharmacist with some of the children who have benefited from medicines and medical supplies. With nearly seventy percent of its population living in poverty, Honduras is one of the poorest countries in the world. Many Hondurans live in remote rural regions, working the land to earn income. Despite their efforts, they are unable to earn enough income to pay for basic services, such as healthcare. Healthcare services, especially in remote regions of Honduras, are scarce, unreliable, and often unaffordable. There is a national health system in place, but the country’s resources are too limited to provide adequate services to the entire population of nine million people. Many Hondurans are neglected and vulnerable to even the simplest health concerns. Families, especially in rural regions, do not receive even the most basic medical care. Unaffordable and inconsistent transportation makes the long journey to a health facility nearly impossible. Add to this the high cost of medical treatment, and families have no choice but to forgo the care they need. Individuals often suffer needlessly from common and easily treatable ailments such as fever, pre-and-post natal discomfort, malaria, infections, headaches, coughs, colds, and diarrhea. While the latter is little more than an inconvenience in North America, in Honduras it often proves fatal if left untreated. While poor families may try every means possible to reach health facilities and receive medical treatment, often it is too late. Community pharmacies offer a locally managed solution to the challenge of providing healthcare in rural Honduras. By providing medicines and medical supplies to support existing health facilities in Honduras, HOPE International Development Agency is helping address a chronic lack of medical care in the country. A local partner runs an extensive medical program across the country and distributes these items to many different health facilities, including more than five hundred small community pharmacies that are often located where no other health facility exists. The community pharmacies provide healthcare to many individuals living in remote regions and are responsible for helping treat more than seventy percent of all local ailments. Watch for next week’s post to learn more about the vital role that community pharmacies play in rural areas of Honduras. Self-help groups provide women with opportunities to expand their capabilities and begin their journey out of poverty in a sustainable, self-directed manner. Santa Maya Bayalkoti is among a group of women in Dobato, Sindhupalchwok, Nepal who are working together to transform their lives and community. The earthquake of 2015 destroyed all Santa Maya’s meagre possessions. But it took more than Santa Maya’s possessions, it took away opportunities for her to move beyond surviving. Following the earthquake, Santa Maya received emergency relief supplies, as well as medicine, clothes, and a shelter for her family. Later, Santa Maya joined the Godavari Women’s Self-Help Group as it was being formed, and participated in adult education programs, training, and a loan program managed by the group. The training, along with a small loan from the group’s loan fund, enabled Santa Maya to begin vegetable farming and goat raising. More recently, Santa Maya received training in raising poultry and buffalo. Today, she sells eggs and buffalo milk at the local market, giving her a stable, sustainable weekly income. Santa Maya and the other women in the self-help group she joined after the earthquake are transforming their lives through their own efforts and through mutual support. Santa Maya’s life is much different than it was after the disaster. Today, her family is thriving, and she is even able to contribute to the savings fund of her self-help group each month. 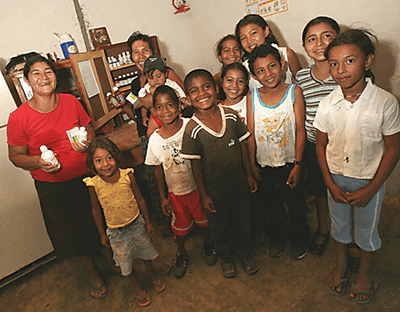 Santa Maya continues to be the author of her journey out of poverty. “Thank you for giving me the confidence and support to start something of my own”, says Santa Maya. Self-help groups, like the Godavari Women’s Self-Help Group in Dobato, function as microloan programs, but provide much more than financial assistance. They also create a community of women who encourage, support, and inspire each other to succeed in their journey out of poverty. Children are no longer becoming sick or dying because of the water they drink. Gone are the 4-hour treks mothers and children made every day in search of water, most of which was disease-laden and potentially deadly. The risk of injury mothers faced from carrying 22 kilograms of water on their backs across rocky paths, is also gone. Yet right now, many mothers in Yella are facing a challenge that threatens to stop their journey out of poverty. Yes, the mothers of Yella have clean water. But while clean water is crucial, it’s just the first step towards self-reliance. Having clean water solves the problem of waterborne diseases damaging the health of the community and taking lives. But clean water alone can’t solve the challenge of mothers not having enough income to care for their families. Mothers in communities where friends of HOPE International Development Agency have given to establish women’s self-help groups are well on their way to becoming self-reliant and free from poverty. Meseleah, a 33-year old mother in Yella, is a wonderful example of what happens when the kind of help you can provide arrives at the right time. Support from friends of HOPE made it possible for Meseleah and 19 of her friends and neighbours to start a women’s self-help group, facilitated by a local leader in their community. “Being part of a women’s self-help group has really benefited me and my children,” says Meseleah. Meseleah and her group achieved success because they learned to save money, create and manage small businesses, and most importantly, work together to solve the problems of poverty in their community. Meseleah’s group created sustainable incomes by weaving traditional clothing to sell at the local market. 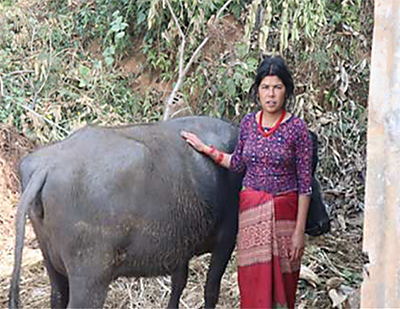 Recently Meseleah took a small loan from her group’s shared loan fund and bought a milk cow. The milk Meseleah sells at the local market, along with profits from the sale of weaved clothing, supports a sustainable livelihood Meseleah has created to feed, clothe, and educate her children. There are mothers who have not yet received the help that transformed Meseleah and her family. A woman’s self-help group of 15 - 20 women costs $125 per woman. A gift of $125 covers the cost of training, support, and the establishment of a group loan fund that a mother can access to establish a small business that will generate a sustainable livelihood for her family. Women’s self-help groups, and the mothers who participate in the groups, become self-reliant. 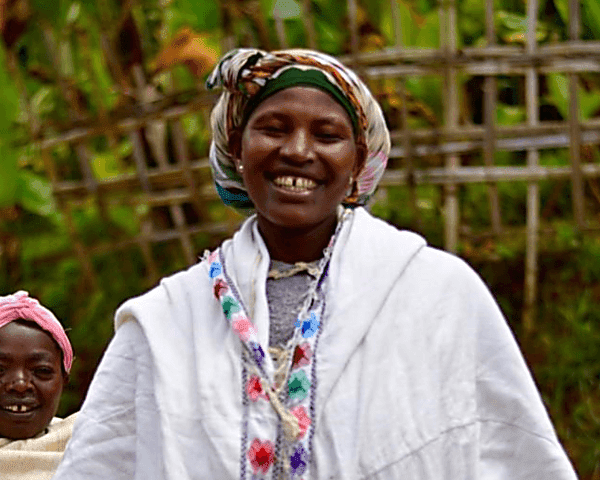 Each time a mother takes a modest loan to establish a small business to support her family, she pays an affordable amount of interest, along with the loan amount, back to her group, growing the loan fund. The more a mother puts into savings, the more she can borrow to expand her business and create even more income. The value women place on supporting each other and working together is evident in the loan repayment rate, which is 100% for groups previously established. Help a mother in Ethiopia become self-reliant. 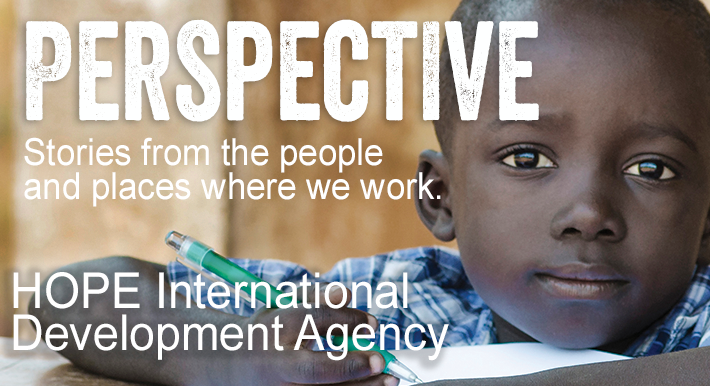 Visit HOPE International Development Agency today and learn more about our work among the poorest families on earth.